Sie haben eine Frage zum (109 m²), 2 Schlafzimmer und 1 eigene Badezimmer in Malasana (Sweet Inn Apartment - Monteleon)? 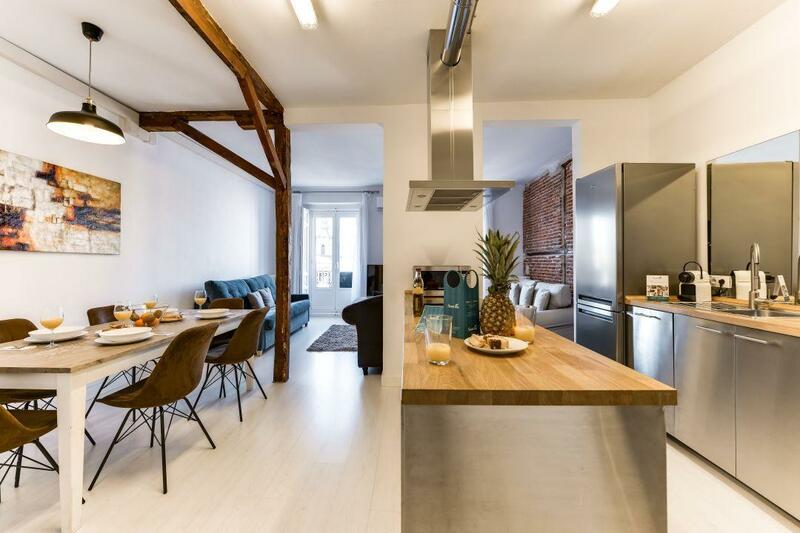 In the heart of Madrid’s Malasaña neighborhood, the 2-bedroom Monteleon vacation apartment is an upscale gem in a great location. Known for its vintage treasures, hipster vibe, and great art scene, the neighborhood will make you fall in love with Madrid. It’s a short walk to the Modern Art Museum (5 min), the Cultural Center of Conde Duque (7 min) and the San Antonio Church (10 min). Buses are around the corner and the San Bernardo Metro is close (5 min). Tastefully styled by our local interior designers, this apartment brings you chic antiquity and stunning views. Elegant furniture and Spanish-inspired wall art set this space apart. Plush bedrooms, floor-to-ceiling windows, and a fully equipped kitchen will make you feel at home. Premium amenities include a Nespresso machine, free WiFi, cable TV, hotel beds and linens, and high-end toiletries. Perfect for an adventurous family or a group of friends, this apartment will make your Madrid experience unforgettable.